satashi!!!!!! I really love this fic and I almost cry when find this here. i hope you can continue with this soon!!!! Ooh! I didnt know you had this fic here! anyway, hope to see the next part soon! The bar was unusually quiet tonight. Normally the Roxbury was crowded to the point of me wondering if a fire marshal was going to shut the place down, but this night seemed to be dragging for some reason. As I sat at the bar, Alton greeted me with his usual grin and welcoming. After replying and holding a five minute conversation, I was given a drink to sip on while waiting to see if my informant would show up or not. It didn’t take too long for him to sit next to me. The male was always calm around me, and I suppose we could even be considered friends if you really broke it down. I helped him and he helped me… Although that didn’t stop him from charging, and it didn’t stop me from asking near impossible things from him as well. “Evening,” I spoke to him casually. I smirked. “Half-off.” He looked at me a moment before grinning and nodding. I cut the man a check and gave it to him before pocketing the flash drive and standing up. Alton, who had been there for the entire exchange, didn’t say anything about it and bid me a farewell when I waved at him. When I got out into the night, I took a deep breath. There were vampires around, but I didn’t really care right now. I made my way across the street and then towards a building not too terribly far away. A fifteen minute walk gave me access to a multi story skyscraper. I walked into it so easily I drew attention to myself. Vampires were everywhere, and almost every single one of them sank back when they saw me. When I made it to the receptionist, I leaned on the counter and grinned at her. She sank back and averted her eyes before asking me how she could help. I sweetly asked if I could see Chrono and was given his room number. Even though I knew where he was, I had the mentality of being polite beaten into my personality. I liked being liked, even if it was out of fear. Besides, being female came with perks. I could normally make people do what I wanted just by batting my eyelashes at them, even without my vampire charm. This made me chuckle to myself as I opened Chrono’s door with a soft knock. The man was standing by the bed and was looking over at me with a mixed expression. “Hey Chrono,” I tried to break the ice. “I’ve already caused you enough trouble.” Chrono shook his head and I walked over to him when he turned away from me. I let myself into Nanoha’s bakery and went up the stairs leading to her small apartment. The lights were mostly off, but I caught Caro in the small kitchen sneaking a cookie. I shooed her off into bed and told her I came to look after Nanoha again. Even though she insisted that her cousin would be fine, I pulled the ‘don’t talk back to your elders’ card and she meekly retreated. Nanoha was still asleep when I got to her room, lying on her side and facing the wall. I took her temperature and frowned at the fever. She was burning up and sweating lightly, but I could tell she was cold from the covers being kicked down a little in her sleep and halfly pulled back up. I sighed and got a washrag from her bathroom to dampen so I could wipe the sweat from her body. Nanoha weakly opened her eyes at being disturbed and tried to talk to me, voice barely a whisper. 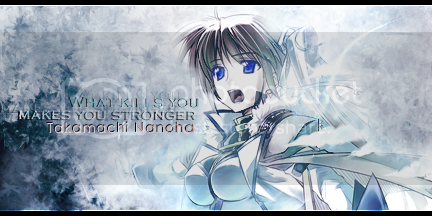 “Yeah… Sorry about that.” My words made Nanoha look at me a moment before her eyes widened. I didn’t really know what to say to that. I knew she would be bad off, and I kind of expected her to try to overpower me, but actually having experienced it left me with a light confusion on how to comfort her. “The thirst is bad, I know.” I said the first thing that I thought of, and I regretted it when she groaned. “Is that what it’s like?” She asked so softly that I would have missed it if not for my enhanced hearing. “If you say that I can leave you, I’ll hit you for real,” she warned me, turning back to try and glare but ending up just looking weak and tired. “Stay with me tonight?” She asked of me instead. “… Okay,” I gave in to her selfish desire. I knew she would probably sleep most of the day away, which meant I could probably be in bed for the next twelve to sixteen hours. Granted, I was patient enough to not even bat an eye at this, but I had things that needed to be done. I had things to read… but Chrono was out now. I could get him to bring me my laptop. With this on my mind, I reached over to rub Nanoha’s back and held her close despite her being burning up hot. She snuggled against me and I closed my eyes, willing myself to sleep. Mmmh, hard to choose, I'll go for B. Since nanoha's going to spend the day sleeping B it is. I agree with your reasoning. It's B then. i'll go against the grain and choose A - dream time!! Nice seeing this being continuated! I'll go with A cause I want to see what Nanoha will be doing this time. i really like this story. i hope you'll update soon.. I am still writing on it randomly. On a side note, Season 1 will be in book format very, very soon. Hopefully by the end of the year! I miss VampireFate... when will this be updating?